I led my first paid project management webinar this week and had a blast! I got to teach and interact with people who wanted to learn more about managing project risks. It was a great experience personally and professionally. Personally, I tapped into my communicative gene. I loved to communicate, share and exchange ideas with people. I tried learning something new every single day. 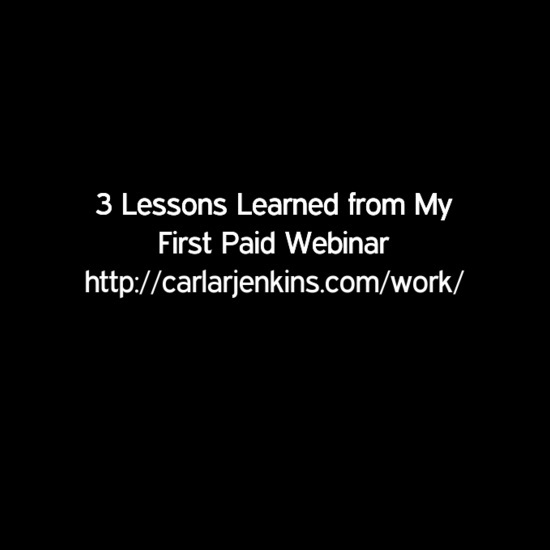 Below are my 3 lessons learned from my first paid webinar. Validated my pursuing my Project Management Professional certification – This is my first paid gig that isn’t connected to a salaried job. Also the company sought me out on LinkedIn. I started pushing myself on LinkedIn after receiving my ITIL certification. I wrote the PMP’s Take on ITIL and caught the eye of the company. I secured my first paid webinar that way. Yes, I received my Program Analyst job with my CAPM and my Business Analyst with my PMP, but this paid webinar was special because it wasn’t connected to the traditional job market. The power of LinkedIn – I knew that LinkedIn was the business social medium but I leverage my account to get this gig. Three things helped me on LinkedIn: LinkedIn Pulse, native video uploads and Project Management Mondays Live episodes. As of this week, I reached 200 LinkedIn Pulse articles. I promised myself that I would write actionable content giving readers small wins. This no-fluff strategy helped me gain a following and opportunities. I also shared my Project Management Mondays Live episodes (PMM Live) with my LinkedIn followers. I noticed that people from Project Management Institute (PMI) were watching my videos because I started receiving LinkedIn connection requests. Although I didn’t have 20,000 views, my target audience watched my videos. Finally, I doubled down on uploading as many videos directly onto LinkedIn. LinkedIn favored native uploads allowing me to gain 100 new followers on one month’s time. 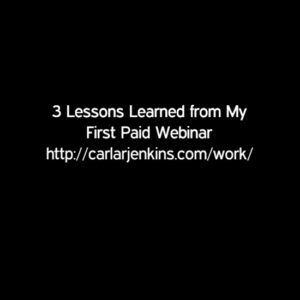 These three things helped me harness the power of LinkedIn and land my first paid webinar gig. Taught me what was hot in the marketplace – I used to think that writing general or basics project management pieces meant selling out and watering down my content. However, working with this company helped me better under what sold in the marketplace. Creating a more introductory webinar appealed to the masses. The goal of these free webinars was to gain exposure. These people could become my new clients. I started expanding my project management basics and how-to content to attract as many people interested in project management as possible. The sky’s the limit for me! I truly see myself getting more paid webinar and training opportunities. I look forward to doing at least 2 more this year. Moreover, I am incorporating all of these lessons into my business to increase its brand position. As always, I will keep all of you informed about what’s next. I love when folks share these types of lessons. It is so helpful to learn about what went well and what did not. Thanks for sharing. You are very welcome. I always write about the good, the bad and the ugly whenever I achieve something. I want people to learn from my mistakes so that they don’t make the same ones.